The upper falls were painted from 1911and the artist’s 2008 photos combined in Photoshop. Lynda comments: “The lower half of the Big Falls (of which the town of Cuyahoga Falls is named) still exists. But the power grab in 1913 probably destroyed the upper falls portion, as the foundation of the base of the dam seems to be located in the same area. Ironically, no power was ever generated from this dam, as the Cuyahoga watershed is not sufficient enough to generate electricity. 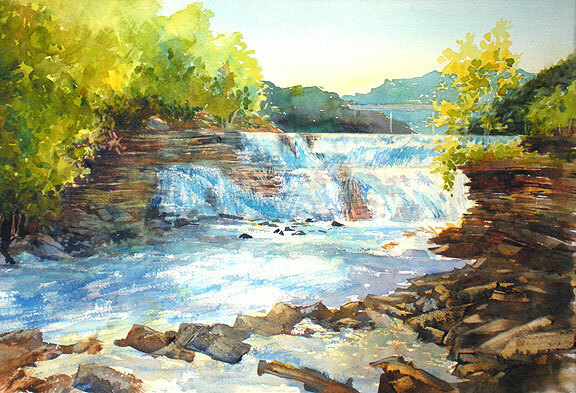 My hope is that, with the new clean river laws, the dam will be removed in my lifetime.” Lynda’s painting envisions that bright morning in the future.